With Slash and my loyal friends by my side, I'm in a race against time to stop a team of sophisticated hackers on a deadly mission. My team of geeks is brilliant ... but derailing an international plot for revenge will take everything we've got. Lexi is a director for X-Corp, an intelligence and security company. She is a guest speaker at a hacker's convention and, while on a break, is mistaken for someone else and handed the code for a hack into a government agency. Once the error is discovered, someone tries to kill Lexi because of what she now knows. She tells her boyfriend, Slash, who is a government agent and fellow hacker, about it and they determine what the hack is about and try to neutralize it. There is a mole in one of the government agencies so Lexi and Slash must run and hide. While all this is going on, Lexi's best friend, Basia is getting married in a month and Lexi is her maid of honour ... which means she has to go with Basia to buy the dresses, plan the bachelorette party that is happening this Saturday, etc. As a geek lacking in social skills, these are the last things that Lexi wants to do but she can't let her friend down. 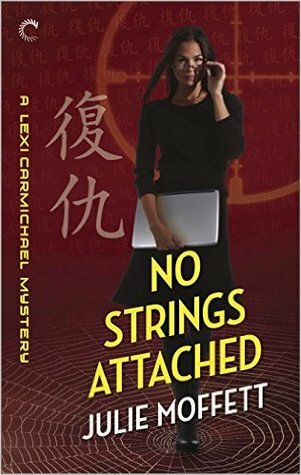 Though this is the eighth (and latest) in the Lexi Carmichael series, it works as a stand alone as you are provided with background (though it does help if you've read No Room for Error). I've liked the series and thought this book was okay (I've enjoyed some of the others more). It is written in first person perspective from Lexi's point of view. I liked the writing style and there was humour. I enjoyed the non-hacking part of the story more as it was lighter and funnier ... like Lexi going with Basia to try on her wedding dress for the first time and attending the bachelorette party (needless to say, both are memorable).